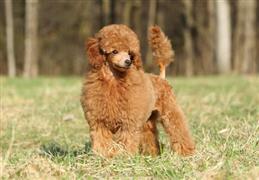 The Poodle is often viewed as being a well-groomed show dog. Their skills in dog sports and composure make them top contenders in a lot of dog related events. Many good names can be found from the results of competitions and dog shows. Although Poodles are very smart dogs, they have managed to develop a dumb-blonde stereotype among many. A fun way to come up with a name is to consider top celebrities that fit this beauty before brains profile. Because of the heavy grooming tag, you might also want to consider words related to primping and prettying up. We have compiled the following list of Poodle names to ensure you have plenty of fitting and satisfying options for you new puppy. Some of our pages will contain a subcategory. A subcategory is a slightly more specific grouping than the main topic of the page. For a subcategory, we will include a separated table of names and corresponding descriptions. An example of a subcategory of Red Dog Names would be 'Dog Names Inspired by Red Wines'. If you have any subcategory ideas for the Poodle Names page, we would love to hear them. Use the form below to submit your ideas.